Day three comes in the form of hoping for Spring, yet prepared for crazy. Vancouver seems to be having a identity crisis of weather right now. Just today we have had spots of bright sunshine, rain, snow, and lightening. Highly unpredictable. I really do feel like I'm living out a point of the challenge today as this is a frock I haven't worn except once, right after I made it, in October. The reason being that I made it to fill a necessary dress requirement for something, and so making it in great haste, only to feel displeased with all the flaws created by that. It is definitely not what I would consider up to par. So today I had to get over all of the things I see wrong with it and just wear it anyways. Perfectionism be damned! 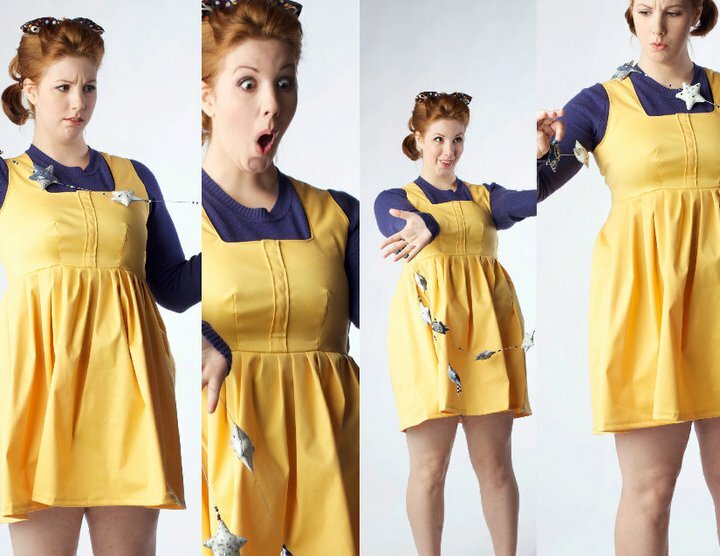 I made this frock, never posting it until now, for a photo shoot for the theatre company I work for. They have a Christmas photo shoot of one theme or another each year for a fund raising campaign, and this past year the theme was Whoville and the Grinch. I, therefore, needed to become a Who, complete with mixed bright solid colored garments. So this frock came to be. Photo credit goes to Kevin Clark Photography for this last one. Oh, and the bodice pattern used for this dress was the Danielle from Burda.